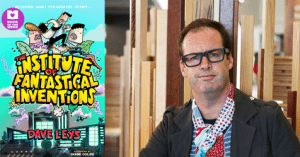 On the release of The Institute of Fantastical Inventions, author Dave Leys shares with us his inspiration for the book, research he undertook and what’s next. What led you to write The Institute of Fantastical Inventions? It started as a short story and really it was all born and contained in the opening two lines – Leo McGuffin had what was almost certainly the best job in the world. He was Chief Technical Officer at the Institute of Fantastical Inventions. As a premise for a story I could suddenly see a whole world open up – a strange place where anything – absolutely anything conceivable – could be invented. It’s about the power of science, the power of imagination, about how if humans set their mind to something, they can achieve anything. I exaggerate the power of science until it is almost like magic. To me the things humans can achieve with technology may as well be magic – we can remotely analyse soil on planets like Mars! We can send mini cameras inside the human body! We can be brave and fight for what we believe in, like truth, like other people we care about. Humans are incredible. Of course, humans are also really silly. So, Leo McGuffin, the hero, is a bit clueless about how to relate to other people, which Dr Andrea Allsop reminds him of, often! And people have crazy fantasies, which is what the Institute of Fantastical Inventions tries to fulfil. So, it’s also about a world – just like ours – in which people are more and more specific in wanting to have their dreams come true, like people wanting a third leg, or to be mysterious. It’s aimed at readers who love comedy, inventions, adventure and the crazy push and pull between people. 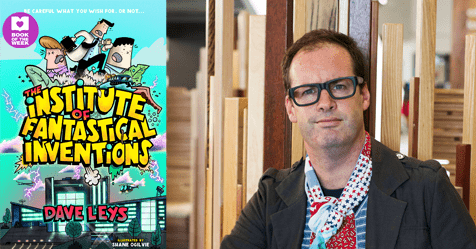 Younger readers will get a kick out of the wacky characters and puns; older readers will also enjoy the way the book digs into ideas about inventions and the world. Did you have to research along the way in writing this? I did. It was great fun learning about all sorts of things – how stickiness works, what makes things float and then burst, the anatomy of sharks and electric eels. Of course, some stuff I, ahem, made up! Will there be more of these books? There will. The Institute of Fantastical Inventions is full of interesting scientists and the world is full of people with weird fantasies so there will definitely be future books with further adventures. Plus, readers will need to know if Leo McGuffin and Dr Andrea Allsop will ever get on or keep fighting and if boy genius Edward will ever find love! Who are some children’s authors you admire? When I was a child myself I always had my head in a book and adored writers like Roald Dahl, Douglas Adams (who wrote The Hitchhiker’s Guide to the Galaxy), Susan Cooper, Tolkien, Richard Adams, the Adrian Molebooks by Sue Townsend, and the Professor Branestawm books by Norman Hunter. More recently I have really dug funny books by authors like David Walliams and Louis Sachar.